Olohuone 306,4 km² is an urban public art festival in Turku, Finland June 7th to 9th, 2018. 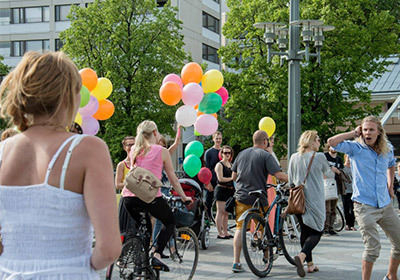 Experience surprising and delightful art installations, performances and happenings on the streets of Turku. The events are free of charge, welcome! For more information, visit our Info Point at Sylvi Salonen, or check our Olohuone 306,4 km2 Facebook page for updates. Since 2005, Olohuone’s annual festival has approached urban art from different perspectives. The festival’s theme changes annually and in earlier years has speculated the line between what’s permitted and what’s forbidden, considered art through touch and pondered what’s cliché – or even: what is art? Our aim is to organize a festival that is accessible, sincere and ecologically friendly linking to its surroundings. Information about past festivals and events can be found in our archive (only in Finnish).